The world of Red Dead Redemption 2 is huge and has so much to discover outside of the main story missions, with enough side quests, collectibles, and other activities to keep you occupied for weeks and months to come. This being a Rockstar game, there are also secrets hidden away for keen-eyed players to discover, with one of them being a series of killer clues. Once you get on the trail, it's pretty clear that there's a serial killer on the loose, and it's down to you to follow the clues and bring the perpetrator to justice. If you're looking for assistance on where to find the next clue or which location to go to, we've got all the information you need. You can start the hunt for the killer at any time once you’ve completed chapter one and are free to explore the open world. You can also visit the locations in any order you wish but we’re starting just south of Valentine, the first town you’ll visit in the game. From Valentine head towards the path to the right of Castor’s Ridge on the map. Here, just off to the side of the path, you’ll find a leg. Head up towards the bridge and there’s a body hanging from the structure and some words written on the rocks. To the left of this is a head with a section of a map in its mouth… nice. Now you just need to find the two remaining pieces to complete the map. The second is to the right of Braithwaite Manor at the ‘S’ in ‘Scarlet Meadows’ on the map. Here, strung up on the incredibly creepy tree is another body, some more writing and, around the back, another head with the next map piece. The final section take us to the south of Wallace Station, up the hill to the south of the river. Walk up the hill and you’ll discover a rock, another body and on a smaller rock to the left the final piece of the map. Sorry about the state of my coat - I got attacked by a bear. Once you’ve collected all three pieces a prompt will appear on screen informing you the map has been pieced together. Open your Satchel and open it up. 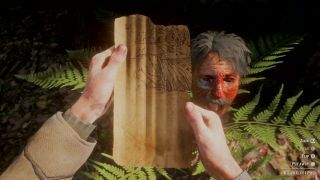 On the back is a sinister message but the image on the front is pointing towards a new location on the map and a combination to open whatever you find there. That location is back up towards Valentine at a place called Lucky’s cabin (it’s just south of Valentine on the map). When you arrive a stranger icon will appear, indicating you’re in the right area. Head towards what’s left of the building and when prompted, open the basement doors. At this point it’s worth saying that the rest of this hunt is best experienced without knowing anything more so if you want to do that leave now. Warning, don't read any further if you want to experience the end of the Red Dead Redemption 2 Killer Clues mystery for yourself. Still here? Ok in we go. Once you’ve found the killer inside you need to take him back to Valentine, so load him up on your horse and head back to the sheriff. Put the killer in jail and know you’ve put an end to this mystery… or have you? Just before he’s put behind bars the killer will attack the sheriff. Here you have a choice. You can shoot the killer, saving the sheriff, and earn a small reward or let the sequence play out until the sheriff deals with it himself. You’ll get nothing if you chose the latter option but it’s more fun. Looking for some more interesting encounters? Then check out the best Red Dead Redemption 2 strangers you can meet.